Provided you have obtained the correct permission from your susbcribers, importing your subscriber list into your account is a really simple and straight-forward process. To get started, your subscribers need to be in a comma or tab delimited text file. This is a standard format for storing data and is supported by most applications, including Microsoft Excel, Microsoft Outlook, Outlook Express, ACT! and GoldMine. Each field is separated by a comma, and each subscriber is on a new line. Select the list you wish to add subscribers to from the "Manage Subscribers". Next, click the "Add Subscribers" button on the right sidebar. Select the "Importing from a file" tab. Your subscribers must adhere to our strict permission policy. If you cannot adhere to the 3 list requirements on this page, you cannot import that list into your account. If your list does meet all requirements, check each requirement and click the "Proceed with the import" button. Click the "Browse" button and browse to the location of the Subscriber text file on your computer or network. After you have selected the file, click the "Import these Subscribers" button. If your file is in the correct format (.txt or .csv), you will be asked to match the columns in your file with your Subscriber List fields. 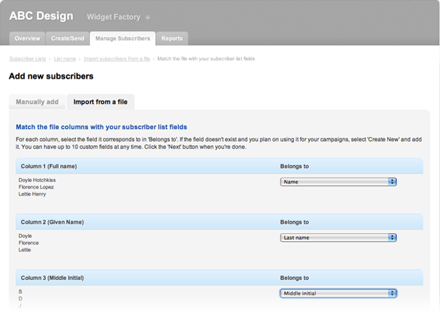 You can even create new custom fields for your list for each column as you go. Once you're done, click the "Next >" button. 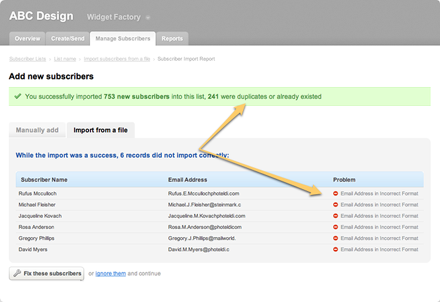 If any errors were found in your file, you will be presented with the Subscriber Import Report, which displays all of the errors founds and gives you the option of either fixing each invalid email address, or ignoring them. If you choose to fix them, you can do so from within your account.